Rowan has been wanting to visit Magic Island at Halibut Point Rec for some time. We didn’t have a lot of time today, but the sun was shining, and the tide was out, so I figured a trip to the rec area could work out. I let the kids look around at Magic Island while I was going to walk the trails – I hadn’t realized (or maybe remembered) there was a full loop on the south side of the park, so I ended up walking that before gathering Connor and Rowan and moving to the north parking lot to do a quick walk through of the trails there. Also new-to-me was a second north shelter that had been dedicated back in 2007. The snow from the weekend was all gone by the time Wednesday rolled around. In the limited time we had, we opted to do Mosquito Cove and since we still had some time, we followed that up with the Estuary Life Trail. It took us about 40 minutes to do the Mosquito Cove loop, though my GPS software said I was only moving for about 25 minutes of that. 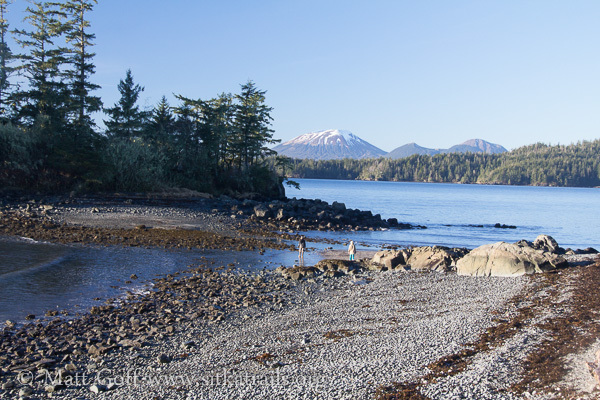 The kids decide we would do the overland portion first, heading directly to Mosquito Cove. It’s .6 miles to to the cove via this section of the trail, then another .9 miles back around, mostly following the shoreline of Starrigavan Bay. 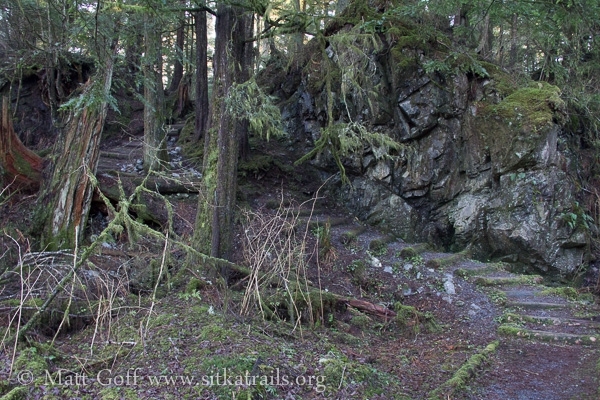 One of the things I like about Mosquito Cove trail is the opportunity to take a look at the rock outcrops directly adjacent to the trail as it comes in (or leaves) Mosquito Cove toward the water side of the loop. These particular rock faces are one of only a couple of places along the Sitka road system that I have noticed Green Spleenwort (Asplenium trichomanes-ramosum) growing, and the only one that is easily accessible via trail, so it’s always fun to take note and say hello them as I’m walking along. With a fair amount of time left before needing to be back for other activities, I decided we could walk the Estuary Life Trail as well. 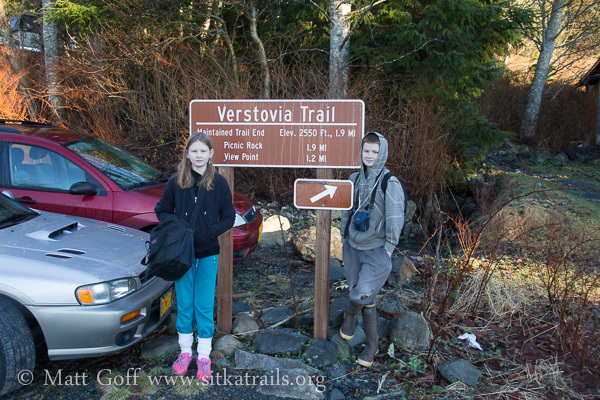 We parked at the viewing shelter parking lot, and I opted to make a loop of it by walking along Nelson Logging Road and then Halibut Point Road, while the kids chose to just go along the trail and back. Although we didn’t see anything too unusual along the elevated boardwalk of the trail, it is always nice to check out what’s going on in the estuary. 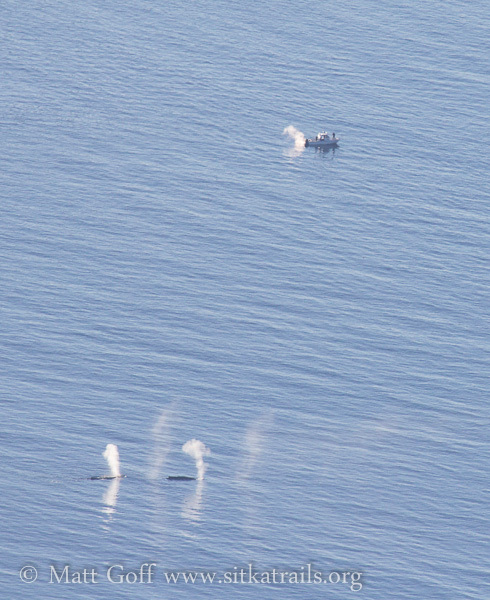 It can be a good location to observe birds, and over the years several rarities have shown up it. The highlight for me was not actually on the trail, but rather a small group of scoters came up fairly close to the road bridge over the river, and among them was a pair of Black Scoters. It was fun to observe them at relatively close range, as they are not very common around here in general, and are even less often seen from the road system. I told Connor and Rowan about my plans to visit all the trails, get tracks and refresh (or in some cases, make) my acquaintance with them in order to update the trails site. They seemed to have mixed feelings about helping me with this project. But only in the sense that Connor was unhesitating in his approval of the idea, and Rowan was decidedly unenthusiastic about the prospect. 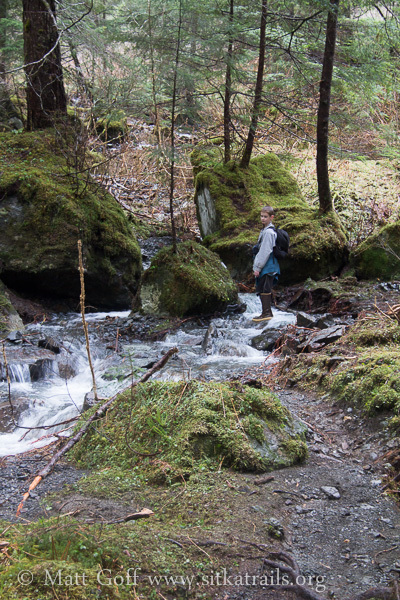 For our first trip as part of this project, we decided to start relatively easy, with Thimbleberry Lake-Heart Lake trail. 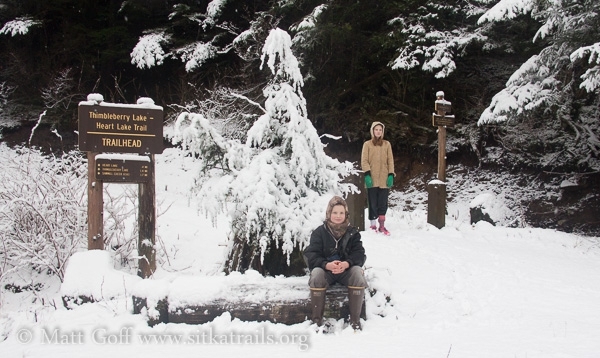 A fair amount of snow had fallen, and was continuing to fall as we made our way up from the Thimbleberry Lake Trailhead. We passed a family with a couple of young boys carrying small snow shovels who seemed determined to shovel at least part of the trail. We also saw other folks coming and going as we made our way along. 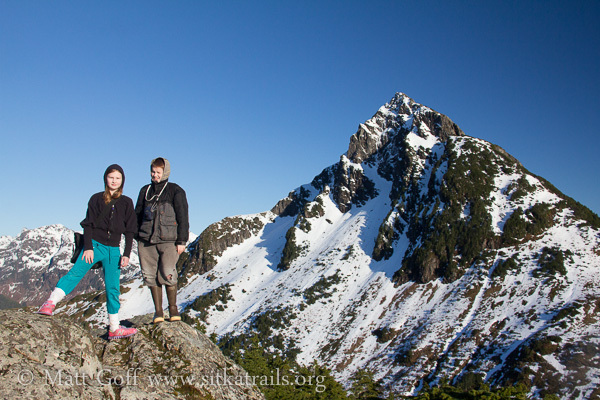 It took us a bit less than an hour to make it over to the Heart Lake Trailhead. 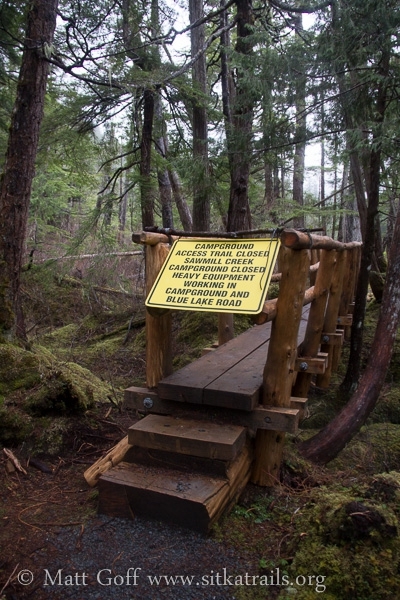 Blue Lake Road is still closed to all non-dam project traffic above the trailhead, but it looked like it might be okay to at least walk the lower section of road between Sawmill Creek Road and the Heart Lake Trailhead. Instead of making a loop of it, we just opted to turn back around and return the way we had come. It took us a little less than an hour each way. As we had a fair amount of time left in the day, we decided to go ahead and see if road conditions were reasonable enough to get out to Herring Cove. 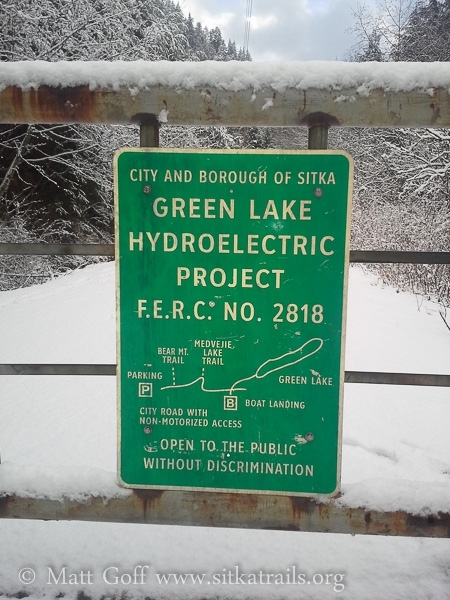 One of the things that inspired me to get back to work on this site was a question/comment left for me about the “Bear Mountain Trail” shown on the sign at Green Lake Road. I didn’t remember seeing such a sign (or at least noticing a Bear Mountain Trail), and was curious about it. I was watching for a sign as we walked up Green Lake Road after parking at the Herring Cove Trail lot. Sure enough, when we reached the gate, there was a nice green sign with a rudimentary map that included an indication of “Bear Mountain Trail”. That seemed sort of funny, since as far as I know, there has never been an official trail up the mountain. 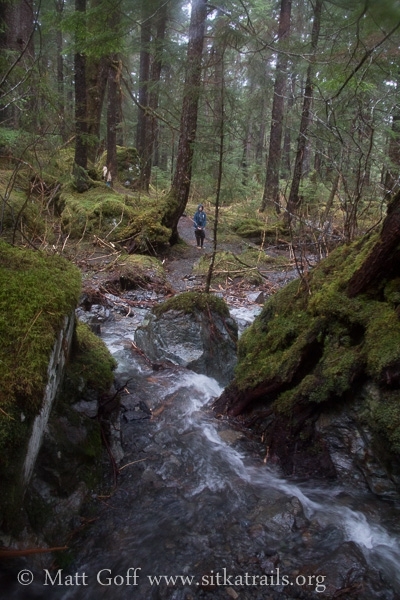 There are at least a couple of different well used routes up the mountain off of Green Lake road, however. The one I am most familiar with starts at Pole 41 and, given the scale of the map, appeared to be the one shown. 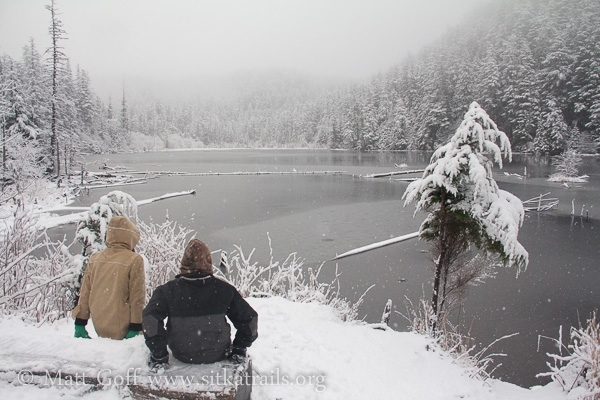 (The other is much closer to Bear Cove and provides access to Bear Lake – I’ve not made it up that one yet.) We ended up walking out as Pole 41 before turning around. 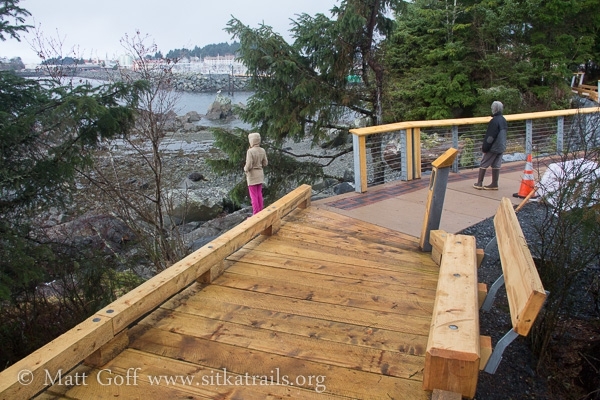 The newest trail in town is the Crescent Harbor Seawalk. It was substantially completed last fall, but has continued to see small additions this winter. 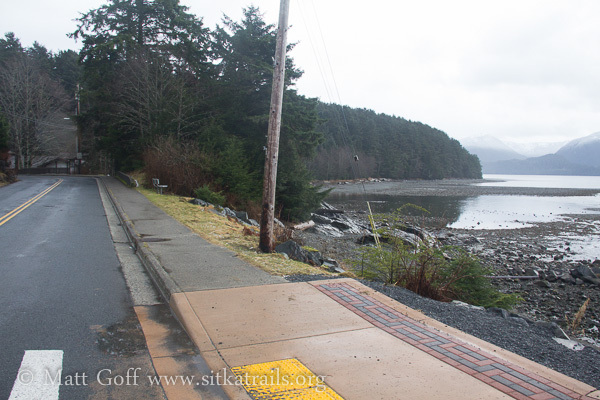 Starting at the Crescent Harbor Parking lot, it follows the water along the harbor (with a spur out along the breakwater), before turning inland slightly to pass along the street side of the Sitka Sound Science Center. From there it once again follows the water to its current end just before Merill Rock. 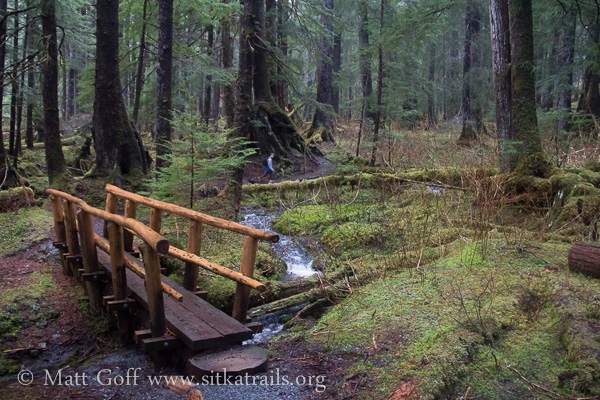 It’s my understand that it ends where Sitka National Historical Park property begins and the park has plans to extend the trail to the main entrance. Connor, Rowan and I walked the trail this morning. It’s a nice walk with consistently wide sidewalk and yellow cedar board walk. There are also several benches along spread throughout. It will be interesting to see if the boardwalk sections eventually need to have some traction enhancement, but for now they seem fine. 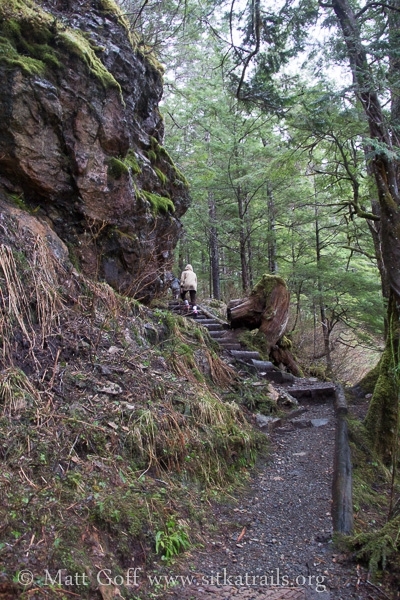 The trail will no doubt get a lot of use from summer visitors, but it’s already popular with locals out for a stroll. It’s not that I’ve not traveled any of the trails in the past 6+ years (hard to believe it’s been that long!?) – but I kind of let this site go by the wayside after I completed the bulk of the trails pages. I kept a little better with my nature centered blog, but poured most of my efforts into the natural history wiki. 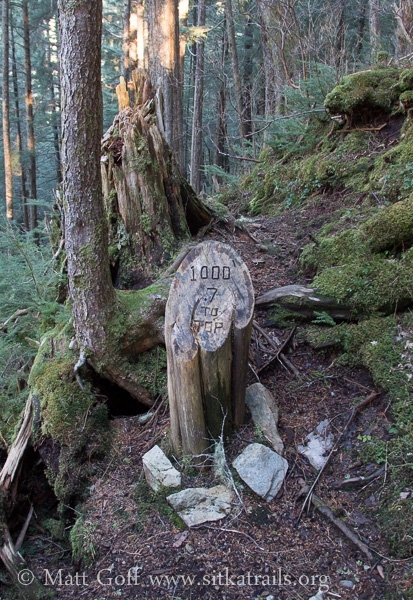 Over the past few years, there’s been quite a lot of trail work done – both improvement of existing trails, as well as the creation of new trails – sometimes completely new, and in other cases extensions of existing trail. I recently decided it’s time for an entire site upgrade. To that end, I’ll be converting all the trail pages into a new, hopefully richer and easier to update format using different software. 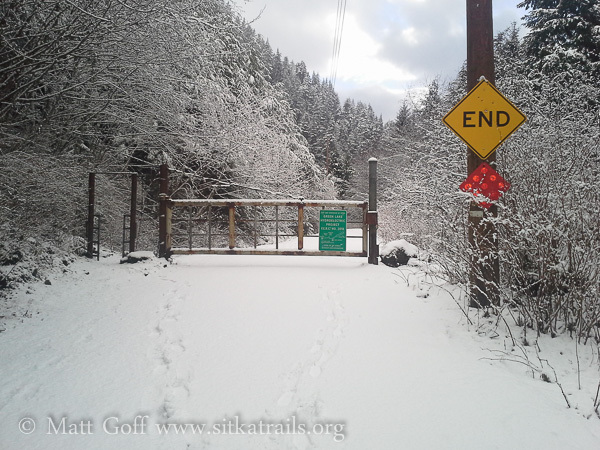 I am also hoping that in the end it will be possible for interested trail users (maybe more than just me) to provide updates and such for current trail conditions. 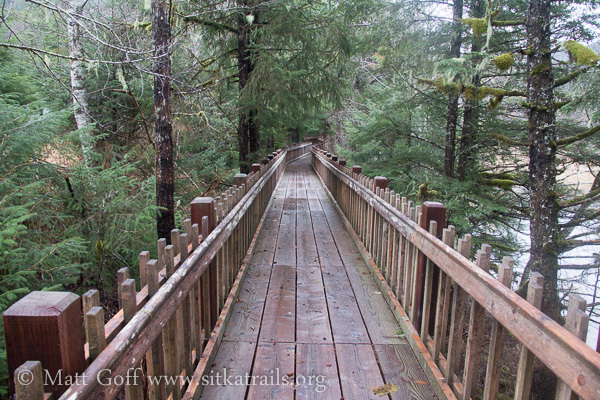 In the coming months, I intend to traverse all the trails along the Sitka road system at least – and hopefully at least some of the ones near by that are off the road system. I’ll be making gps tracks to include on the site, and getting myself a little freshened up on overall trail conditions. As I do this, I figured it would be worthwhile to reactivate this blog to document some of these outings.